Charles James Kirkpatrick has a triple doctorate in science and medicine (MD, PhD, DSc) from the Queen’s University of Belfast (N. Ireland) and is emeritus Professor of Pathology at the University Medical Center in Mainz, Germany. His academic appointments were at the University of Ulm, Manchester University, the RWTH Aachen (1987-1993) and the Johannes Gutenberg University (JGU) Mainz. He is a Fellow of the Royal College of Pathologists (FRCPath), London and has both honorary and visiting professorships in China, Singapore and Sweden. He is author/coauthor of 510 publications in peer-reviewed journals, has been cited > 16.900 times, has made more than 1380 presentations to scientific meetings worldwide [> 495 of which were invited lectures] and has an h-index of 56 (Web of Science) & 68 (Google Scholar). He has supervised 116 (completed) doctorate theses (MD/PhD/DDS) at two universities (Aachen, Mainz), 12 of which were at honours level. He is a former President of both the German Society for Biomaterials (2001-2005) and the European Society for Biomaterials (ESB, 2002-2007). In 2008 he received the ESB’s George Winter Award and in 2010 he was awarded the Chapman Medal from the Institute of Materials, Minerals & Mining, London, UK for distinguished research in the field of biomedical materials. In 2012 Dr. Kirkpatrick was awarded the Silver Medal & Haughton Lectureship from the Royal Academy of Medicine in Ireland (Section of Bioengineering) and the McGowan Institute Distinguished Lectureship, University of Pittsburgh, USA. 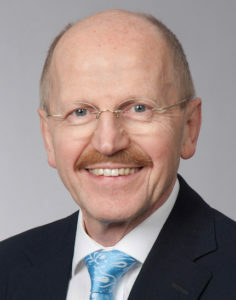 Since 2013 he is an Honorary Member of the German Society for Biomaterials, and in 2014 he received the TERMIS-EU Career Achievement Award (TERMIS congress in Genova, Italy). He is a former Associate Editor of the Journal of Pathology (2001-2006) and Biomaterials (2002-2014) as well as a member of the Editorial Advisory Board of several journals in the biomaterials and regenerative medicine fields. He is a member of the Scientific Advisory Board of a number of research institutes, centres of excellence and companies in biomaterials and regenerative medicine in Europe, as well as the German Federal Institute for Drugs & Medical Devices (BfArM)(since 2007). Biomaterial research for Tissue Engineering is the major focus of my research activity. This is carried out in the REPAIR-lab (Laboratory for Regenerative Pathology & Interface Research), which was based at the Johannes Gutenberg University in Mainz for 22 years until my retirement from the Chair of Pathology in 2015. The lab has moved to the Goethe University of Frankfurt, where I am now Senior Professor, based in the Cranio- & Maxillofacial Surgery Clinic of Prof. Sader. Two principal aspects are emphasized, namely the application of modern methods of cell and molecular biology to study how biomaterials affect cell function, a pre-requisite for success in regenerative medicine. These methods include study of gene expression at both the protein and nucleic acid level. The central element in this activity is the establishment of relevant in vitro models with which to study the biofunctionality of human cells of different phenotype in interaction with novel natural and synthetic biomaterials (scaffolds, matrices, micro- and nanoparticles for drug and gene delivery). Special interest to date has focussed on endothelial cell interactions, as this concerns the important issue of vascularisation of implants and healing response (vasculo-/angiogenesis). We have also developed 3D in vitro co-culture models with human cells, for example, containing bone cells and endothelial cells, thus enabling mechanisms of cellular crosstalk to be studied in detail. Such co-culture systems have also been established for the upper and lower respiratory tract and are being used to develop strategies for pulmonary regeneration as well as particle interactions with the lung. In addition, a stem cell biology group is investigating the regulation of lineage differentiation of adult bone marrow and adipose tissue stem cells for tissue engineering applications, with special emphasis on the importance of early embryonic genes, such as sonic hedgehog. The principal focus is on endothelial progenitor cells (EPC) and their recruitment to the regenerative niche where vascularization is required. A further field concerns cartilage repair using novel biomaterials and signal molecules derived from knowledge on chondrocyte differentiation. The second aspect concerns the use of classical in situ methods of pathology to study the cellular & tissue reaction to implanted materials, including nanoparticles. Of special interest is the identification of the stem cell niche in various organs of interest as a basis for understanding regenerative mechanisms. For this purpose laboratories exist for classical histology, immunohistochemistry and molecular pathology (e.g. qRT-PCR, in situ hybridization techniques, laser capture microdissection), as well as scanning and transmission electron microscopy. Proof of concept is tested in restricted and highly selected in vivo experiments (rodent models).